I am very happy to be guest posting at My Jerusalem Kitchen today. If you haven’t visited Lauren’s blog, then head over there right now and check it out! She has all kinds of delicious, often Mediterannean-inspired recipes that I know you’ll love. Lauren lived in Jerusalem for two years before moving back to San Francisco to attend law school. We met virtually through our blogs and began corresponding by email before we realized that we had met in real life before! Apparently we sat next to each other at a restaurant in Jerusalem last year where Lauren was celebrating her birthday. We even shared a birthday shot, care of the bartender. Small world indeed! It’s too bad that Lauren and I became friends after she moved back to San Francisco after two years of living in Jerusalem, but I’m happy that we continue to share recipes and stories through our blogs. I was thrilled when Lauren asked me to guest post for her during busy law school finals. She suggested that I make something that her readers would never get from her, specifically fish and eggplant since she is allergic. These fish tacos immediately came to mind. To get the recipe, head on over to Lauren’s blog and tell her I said hi! I LOOOOOVE fish tacos. Heading over now. I love your 2nd picture – what a beautiful shot! These look pretty tasty-popping over there now! Thanks Tina! And thanks for stopping by Lauren’s blog! OMG I love fish tacos. Been fantasizing about them even over the winter. They are long overdue in this house..and now I wish for you to toss me some right off your virtual pages! 🙂 BTW join #breakingbread linky this month it’s focaccia! These look great … heading over now! 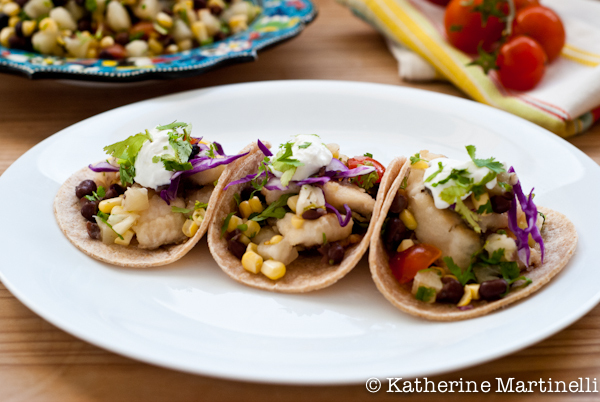 Fish tacos are one of my favorite meals – headed to the recipe now! Me too! They’re the best! I love fish tacos! These look so fresh-flavored and delicious. Off to check out the recipe! Fish tacos are always a top choice of ours! What gorgeous photos – you’re making me very hungry. I just love the online food world and all the inspiring people you meet. I’m heading over to check out your recipe and Lauren’s blog. Me too and me too! Thanks Hannah! Fish tacos are soooo good – going to check it out! They’re my fave! And, if you can believe it, I didn’t have one until I was an adult. We didn’t eat a lot of tacos period growing up though. 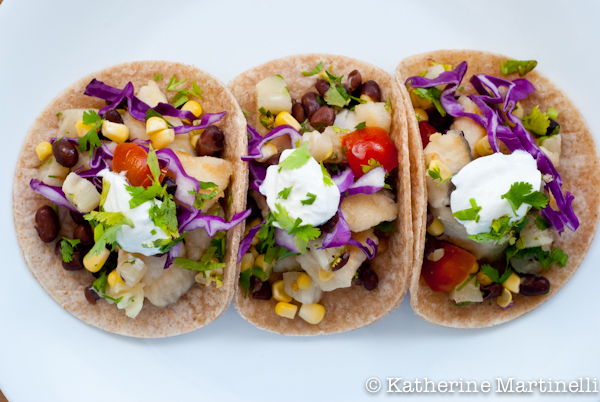 How do I love Fish Tacos…let me count the ways! Seriously – what’s not to love?! Fish tacos are great! Tons of flavor, very healthy. Heading over to Lauren’s blog now . . . I so agree! And so quick and easy too!